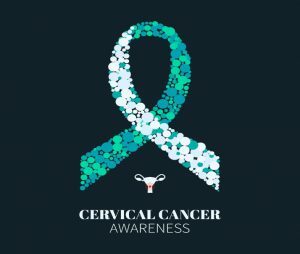 January is Cervical Cancer Awareness Month, and the National Foundation for Cancer Research (NFCR) joins others in raising awareness of and informing of steps toward preventing the disease—one of the most detectable and treatable cancers, if vigilance is observed. Here is information and a set of best practices. Risk Factors: More than 12,000 women in the U.S. will be diagnosed each year with cervical cancer, and nearly 4,000 will die. Ninety-nine percent of the cases are caused by the human papillomavirus (HPV). It is estimated that nearly 70% of cervical cancer cases can be attributed to two types of the virus, HPV-16 and HPV-18, which are often referred to as high-risk types of HPV. Protect: HPV is contracted by having sexual contact with someone who has the virus, which can cause genital warts or develop into cervical cancer. Other risk factors associated with cervical cancer include having many sexual partners, smoking, taking birth control pills and engaging in early sexual contact. Having a regular PAP test at your gynecologist’s office. This test should be done every three years from ages 21 to 30. If these test results remain normal throughout a patient’s early years, risk of cervical cancer developing is low. Having an HPV test. This should be done beginning at age 30 or in response to an irregular PAP test. According to the Centers for Disease Control and Prevention (CDC), after age 30, if both the PAP test and HPV test comes back normal, you can ask your doctor to wait 5 years before your next set of tests. But still complete routine yearly check-ups. Getting the HPV vaccine. This is administered in a series of two or three injections between the ages of 9 and 26, and is recommended by the CDC to be administered to both boys and girls at around age 11 or 12. The vaccine prevents the most common forms of HPV attributable to cervical, vulvar or vaginal cancer from developing. Prudently considering birth control usage. Women who use oral birth control pills have an increased risk of developing cervical cancer. This risk drops significantly and swiftly once the pill is stopped. Taking oral contraceptives for more than a period of five years has been associated with doubling the risk of developing cervical cancer. Early Detection: If detected early, cervical cancer has an exceptionally high survival rate. The 5-year survival rate for women diagnosed early as with invasive cervical cancer is 91%. And, fortunately, approximately 46% of women with cervical cancer are, indeed, diagnosed early. In cases where cervical cancer has already spread to surrounding tissues, organs and/or lymph nodes, the 5-year survival rate is markedly reduced to 57%. Symptoms: Any of the following could be symptoms of cervical cancer. Consider reporting these to your doctor, especially if experiencing many of these below signs. Cervical cancer is a beatable foe for those women who adopt a strategy of prevention and early detection. Beyond that, women owe it to themselves to live long, active, healthy lives without the fear of the disease. The NFCR has long been associated with cervical cancer discoveries. For example, Dr. Harold F. Dvorak, a former NFCR-sponsored scientist and the inaugural winner of the Foundation’s Albert Szent-Györgyi Prize for Progress in Cancer Research, discovered the vascular endothelial cell growth factor (VEGF). Avastin is among the class of VEGF-targeting oncology drugs which have come onto the market since Dr. Dvorak’s seminal discovery in 1983 that cancer cells secrete the protein. Among recent findings is a summer 2017 report on Phase III clinical trials showing that Avastin and chemotherapy extended survival for women with cervical cancer. The combined therapy had already in 2014 been approved by the Food and Drug Administration to treat patients with persistent, recurrent or metastatic cases of the disease.